Ash meets Misty and her Azurill. May leaves her Beautifly and Skitty at the Petalburg Gym. May and Max arrive in Pallet Town. May leaves her Bulbasaur at Professor Oak's. Ash leaves his Torkoal and Glalie at Professor Oak's, but recalls his Phanpy. Ash battle Noland and wins a Knowledge Symbol. May wins the Saffron City Contest. James leaves his Chimecho at one of his old mansions. Brock's Mudkip evolves into Marshtomp. Ash defeats Greta and earns a Guts Symbol. May is given a Pokémon Egg. May wins the Silver Town Contest. Ash defeats Tucker and earns a Tactics Symbol. Ash's Phanpy evolves into Donphan. Ash meets a Pokémon Ranger. May's Egg hatches into Eevee. 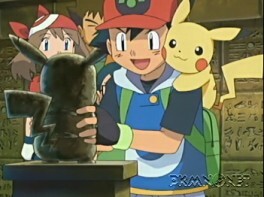 Ash defeats Lucy and earns a Luck Symbol. May loses the Modama Town Contest. Ash's Grovyle evolves into Sceptile. May wins the Yuzihura Town Contest. Ash defeats Spenser and earns a Skill Symbol. May wins another Pokémon Contest. Ash loses to Anabel, but wins his rematch and earns an Ability Symbol. May wins the Kajinoki Town Contest. Brock finds that his Onix has evolved into Steelix. Ash is beaten by Brandon. A wild Aipom starts to follow Ash. May enters the Kanto Grand Festival. May knocks Harley out of the Kanto Grand Festival. May knocks Drew out of the Kanto Grand Festival. Ash catches the Aipom that has been following him. May is knocked out of the Kanto Grand Festival. Ash loses his rematch against Brandon. May learns that Drew and Harley are heading off to Johto. 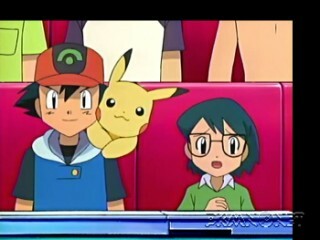 Ash learns that Gary is in Sinnoh. Ash recalls his Bulbasaur, Squirtle and Charizard. Ash wins a rematch with Brandon and earns a Brave Symbol. Ash turns down the opportunity to be a Frontier Brain.